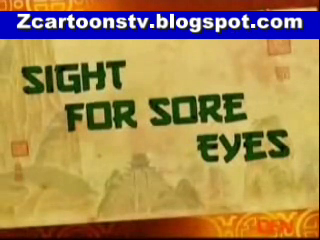 Now You Are Watching Kung Fu Panda-Sight For Sore Eyes in urdu.If You Have Any Kind OF Problem In Watching Video Then Comment Us.If You Like Our Website Then Share It With Your Friends. At Mr. Ping's noodle shop, Po waited tables and was shown to be unusually depressed. After despairing how he was no longer the Dragon Warrior, Mr. Ping explained to a curious customer that the Furious Five had also lost their positions as warriors of the Jade Palace, and were reduced to work as entertainers for children's birthday parties. Furthermore, Shifu had disappeared and had not been seen for days. Po retreated to his room to unhappily sit and reflect on the events that lead to the present. Weeks prior, he and the Five had been rehearsing for the "Presentation of the Seven Forms" by performing the "Pyramid of Fortitude", which required the Five to create a balanced pyramid together, on top of which Po would be balanced. In the practice of this form, however, Po caused the pyramid to topple with his own addition of a one-handed spin. Shifu was displeased by this, insisting that the form had to be carried out in the traditional manner, as it was to be performed for Masters Chao and Junjie of the Sacred Onyx Council , who once trained alongside Shifu under Oogway. Shifu stressed that the quality of the presentation would be a judgement of his abilities as a teacher, and that his students must not do anything to embarrass him (stressing this especially to Po). At that exact moment, Chao and Junjie suddenly arrived, and Po greeted them, displaying his fanboy mannerisms, which left the two masters less than impressed. Chao then stated to Shifu that it was time to partake in the "Masters' Ceremonial Sparring". Po was eager to see this, yet Shifu insisted that he was not yet ready to witness it. Disappointed, Po left to sulk on the stairs, where Junjie assured him that he should be allowed to watch them spar, as he was the Dragon Warrior. He offered to leave the door open for Po to peek in and watch. That night, Po sneaked to the front doors of the Jade Palace to witness the masters' sparring. After a silent, meditative moment, Shifu, Junjie, and Chao all launched into the air on streams of colored light, and sparred rhythmically in the air and on the ground, much to Po's fascination. At one point, however, Junjie broke the rhythm of the controlled sparring to deal Shifu a brutal kick to the chest, earning a reprimand from Chao. After a brief, snide remark from the red panda, Junjie continued to attack, and noticed that Po was watching the fight from the door. The fox then startled his fellow masters by performing the Golden Lotus Clap — a move that, if viewed with open eyes, blinded any who witnessed it. Shifu and Chao looked away while Po was blown back from his perch outside the door, and instantly found himself completely blind. Unaware of this, Chao told Shifu it was time for his students to perform the Presentation of the Seven Forms. The Five quickly reported to the Hall of Warriors, and Tigress, unaware of Po's condition, dragged the sightless panda in with them. Under the scrutiny of the masters, the Pyramid of Fortitude was performed flawlessly, until Po, unable to see, ran in and ultimately wrecked the entire presentation. The masters quickly figured that Po had been blinded from spying on their sparring match and, once Po's eyesight was restored with the Golden Lotus Clap, Chao berated Shifu on the inability to maintain discipline among his students. Despite Po's protest, Chao reluctantly announced that Shifu was no longer fit to be master of the Jade Palace, and demoted him on the spot. Po tried again to defend his master, which prompted Shifu to scold him for questioning Chao's decisions, and he dishearteningly accepted Chao's judgement, leaving the palace and ordering his students to do as Chao and Junjie commanded them. Before Chao departed, he announced Junjie was the new Master of the Jade Palace and that Po and the Five were bound by honor to obey him. The fox claimed that he would restore the Jade Palace to even greater glory than it was before. As soon as Chao left, however, Junjie bluntly gave Po and the Five the command to "Get out". Five clouded leopards quickly appeared at Junjie's side, and the fox smugly remarked that Po and the Five have been replaced and were no longer needed. Po again tried to protest, but the Five were intent to keep their promise to Shifu and remain obedient to Junjie, and left quietly without resistance. Before walking away from Po, Tigress rebuked him for disobeying Shifu's orders and essentially ruining everything they had all worked their lives towards as warriors, finally stating that she and the rest of the Five were "through with [him]." Back in the present, Po ruminated on just how much he had messed things up. In hopes of cheering him up, Mr. Ping sent Po to take an order delivery to the Jade Palace. Po complied, though as he neared the palace with his delivery, he overheard a conversation inside. Peeking in through the door, he noticed that Junjie had been busy redesigning the palace's interior with motifs of him defeating Shifu, and the fox himself saying how he was going to destroy Shifu. Furthermore, Shifu was being held prisoner in the catacombs beneath the palace, and Po barely avoided being caught by the clouded leopards when Junjie heard him at the door. Panicked, Po hurried back down to the Valley and explained the situation to his father. Though he tried to convince the Furious Five to help him, they refused to hear him out and angrily rejected the panda. Despite his father's worries, Po decided to save Shifu himself, and headed back to the palace. After sneaking into the main hall, however, Junjie discovered him. Po prepared to fight Junjie, telling him he was going to bust Shifu out, yet both were surprised when Chao, who had come to check on Junjie's progress, appeared, now aware of the fox's treachery. Chao was quickly brought down with a barrage of arrows to the back, and Po hurried to help the lizard master, which distracted him long enough for Junjie to knock out the panda with a kick to the head. Meanwhile, Mr. Ping had gone to find the Furious Five, who were still working their birthday party gigs. He explained to them what had happened to Po and Shifu, and though hesitant at first, they were eventually persuaded by Mr. Ping to help Po. Back at the palace, Po woke in the catacombs and found himself chained up along with Chao and Shifu. Po apologized to his master, and Shifu apologized as well, telling Po that he had returned to face Junjie after pretending to leave the palace, but was defeated when Junjie released his leopard students on him. He also admitted to Po that if he hadn't been so hard-put to follow tradition, perhaps they wouldn't have found themselves in this situation. After this, Po quickly came up with an idea and performed the Golden Lotus Clap, which allowed him to break his own chains, but also blinded him yet again, as he had forgotten to close his eyes in the process. Up in the main hall, Junjie and his students felt the pulse from the clap, but were stopped from storming the catacombs when the Furious Five showed up and engaged them in battle. Junjie ordered his leopard students to take them while he escaped to the catacombs. Finding Po blind and freed from his bonds, Junjie attacked the stumbling panda, after which Po got the idea of dousing the torch in the room, plunging both him and Junjie into complete darkness. However, Po was able to smell where Junjie was due to the garlic chow mein he'd delivered to the palace the previous day, and used this to gain the upper hand over Junjie. Up above, the Five managed to dispatch the leopards, and raced for the catacombs to help Po, finding him and a chained Junjie on the scene when they arrived. Later, out in front of the Jade Palace, Chao restored Shifu as Master of the Jade Palace, and expressed his gratefulness to Po for teaching them that "sometimes doing the right thing is more important than following the old rules". He departed, unceremoniously kicking a bound Junjie and his leopard students down the stairs, and proceeding to take them to Chorh-Gom Prison. Po then bragged that he had actually managed to teach Shifu something, suggesting this meant he would get more respect from now on. Shifu responded by saying he now respected Po so much that he wouldn't insult him by fixing his eyesight for him. Alarmed at first, Po claimed he could fix it himself, proving this by promptly tripping down the stairs.